Adventures in Cooking – The Final Chapter? While I am by no means a chef or even a real cook, I have acquired enough skillz to know my way around pretty much any kitchen. Of course, the problem when dealing with another person’s kitchen is that you are at the mercy of how much they enjoy cooking too. It is now clear that the owner of this loft or even the people who rent it, must use the kitchen to make coffee, tea and maybe nuke some sort of frozen meal. Combined with truly the lowest range ever, my enthusiasm of cooking has waned considerably since being here. Earlier in the day, things were a lot more promising. 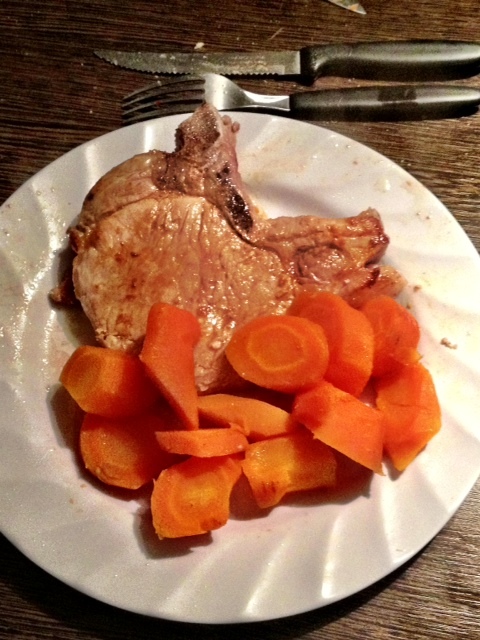 I had found some ginormous carrots at a cool vegetable stand and some farm fresh pork chops to pair with them. The weather was perfect – high 70s with a nice breeze – and I was looking forward to having my meal. I thought about using the building’s parilla but for one person it was a bit much as well as needed to provide all of the items – charcoal, kindling, etc. So, back to the stove for me. My first problem occurred when I discovered there was no peeler. Well, there must be at least some kind of pairing knife…nope. I was left with 2 options – try to hack away at it using a regular knife or use the large kitchen knife. I chose the latter, with slight trepidation given the potential for cutting myself. 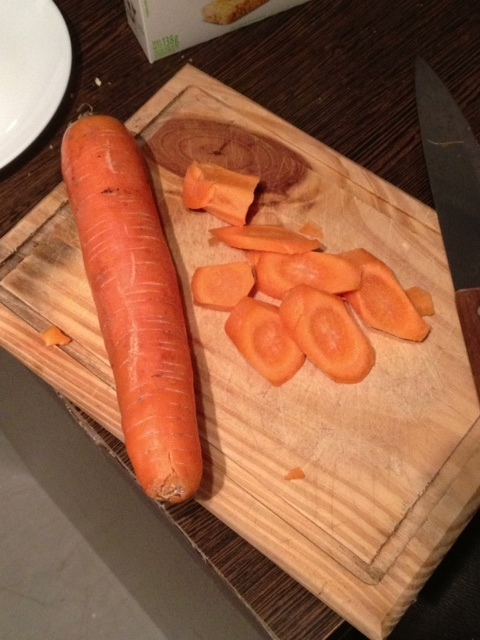 In addition, trying to peel carrots this way makes a mess as well as reducing the pieces considerably. Still, I somehow made it through unscathed. Next up was the pork. Since it was so fresh, I figured it only needed a bit of salt and some Worcestershire sauce that somehow happened to be on hand (the only seasoning in the cupboard.) 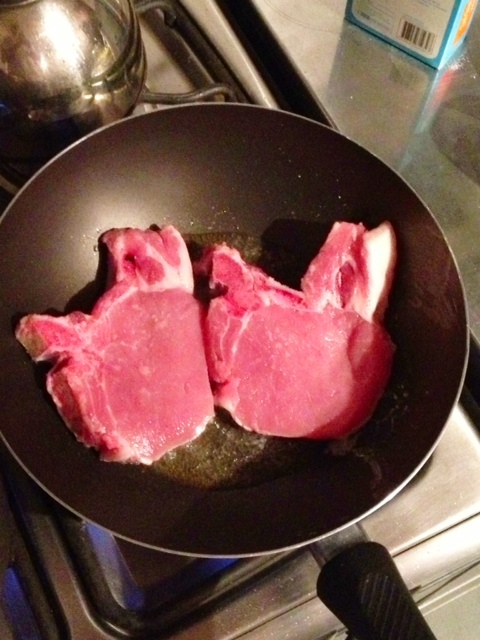 The next challenge was the pan (the only pan) I could use to cook the chops. It was really more of a shallow wok than a sautee pan but it would have to do. One plus with my range is that it can get pans hot very, very quickly. This would be critical to making this work so I could sear the sides with enough heat to make up for the uneven surface of the pan. Did I mention that range is really, really low? While I didn’t have to attend to the chops too much, every time I did, I could feel my back complain. It was about this point where I wondered if this would be the last thing I cooked here. Of course, there were no tongs, only a pathetically small spatula which looked like it belonged with a Fisher Price kitchen set. Still, in the end, despite all of these challenges, the meal turned out to be pretty damn tasty. Not the prettiest girl at the dance but got the job done. The carrots turned out to be delicious too. I’ll see if I’m up for it at least one more time but the amount of effort and patience required to create even a half-decent meal in that effin kitchen is considerable. Posted on January 22, 2013 by reyalto. Bookmark the permalink.